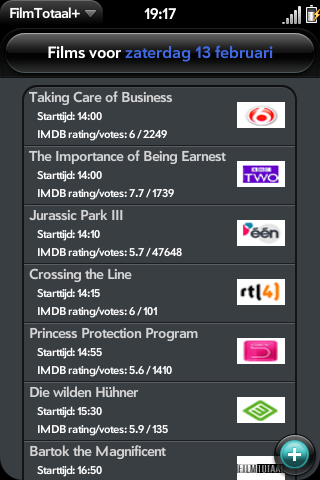 A Palm WebOS app to get an overview of films to be screened on TV. This app is targeted at Palm Pre and Palm Pixi owners in the Netherlands. The film information is provided by www.filmtotaal.nl. This app adds various enhancements over the FilmTotaal app released previously. FilmTotaal will stay available on Homebrew, but no further development will be done on the app. I'm releasing FilmTotaal+ as a beta app on Homebrew but intend to release it to the App Catalog once Palm WebOS devices are carried by mobile providers in Holland.